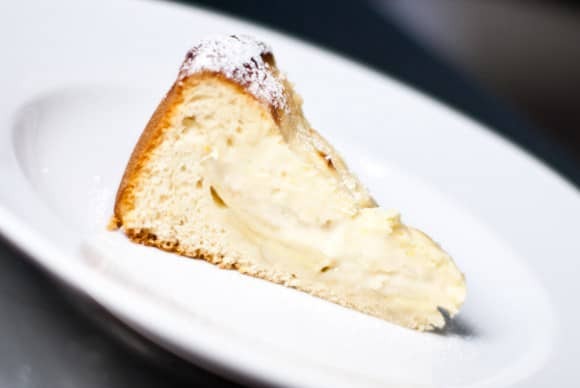 This delicious German cheese and apple cake features a tender bread crust filled with tangy Granny Smith apples and a cheese and marzipan filling. I spend a good deal of time drooling at all the delicious looking things being blogged about around the world. Still, it’s a rare occasion when I see something I’ll actually make. This mostly has to do with the fact that following someone else’s recipe is contrary to the ethos of this blog. There have been a few times, like here and here where I just couldn’t resist. Today was one of those days and after seeing Jenni’s Apfelkuchen over at Online Pastry Chef, I was compelled to head to the store to get the requisite ingredients. Of course in keeping with my philosophy, I used Jenni’s recipe as a guide and made alterations, most notably to the flavours. When I first saw the picture of her Apfelkuchen, before I read the description, my first thoughts were of a pastry with a yeast risen buttermilk crust filled with tart apples, honey, almonds, lemon and cheese. As it turns out I was a bit off in impression. While her version sounds delicious, I used my initial impression as a basis for my version. Apples have a very mild flavour that’s easy masked, which is why so many fruit juices us apple juice as a base. I really wanted the apple to be the star of this dish, so I used vanilla to lay down a nice neutral base, painted on layers of honey and marzipan then added lemon zest to provide some highlights. The result was a rich decadent dessert you don’t feel horrible about having for breakfast. It’s like all the best parts an apple pie and a soft custardy cheesecake all wrapped in a sweet buttery brioche-like dough. If you’re wondering why this doesn’t look like any kuchen you’ve ever seen, it’s probably because kuchen is the German word for “cake” and refers to a whole class of desserts. Käsekuchen (lit. 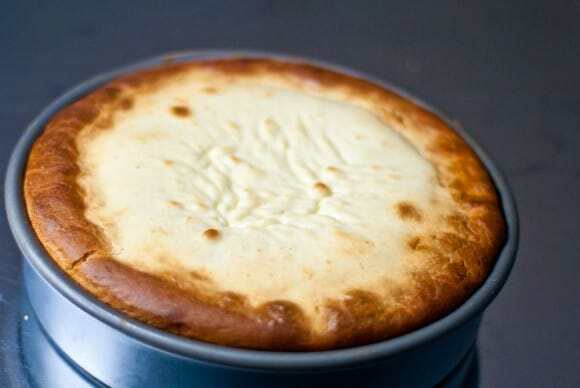 cheesecake) is a more specific dessert which is a yeast leavened pastry that’s usually filled with sweetened Quark. In case you’re wondering, Quark is a fresh cheese, not a character on Deep Space 9. It’s not quite the same as cream cheese, but since cream cheese is easier to find it makes a suitable substitute. Melt the butter then add the egg yolk to the butter and the egg white to the buttermilk. Whisk each one separately then combine and whisk together. Add the vanilla then pour it all into the mixing bowl and stir to combine. 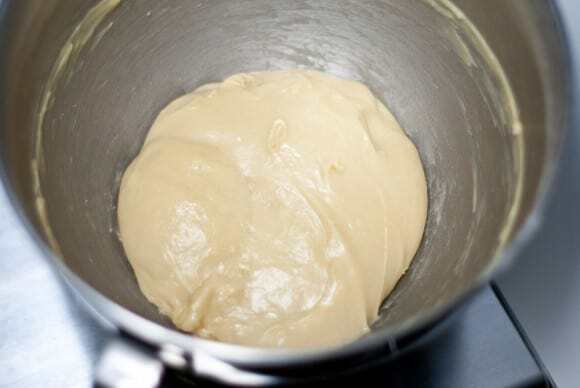 Attach the dough hook to your mixer and mix on low adding a tablespoon of flour at a time until the dough is still soft, but stops sticking to the sides of the bowl. 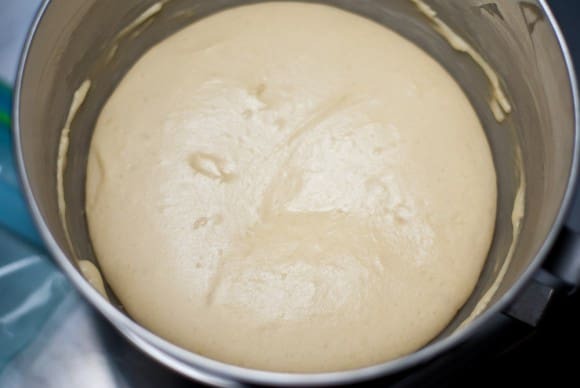 Turn the mixer up to medium and let it do its thing for about 7 minutes or until the surface of the dough is silky smooth. Cover and let it rise in a warm place until doubled (about 2 hours). Put the oven rack in the middle position and heat oven to 350 degrees F.
Mist a 9" round cake pan with non-stick cooking spray, then press the dough into the bottom, coming most of the way up the sides of the pan. Mix the apples, lemon juice, honey and flour to combine then lay down a single layer of apples along the bottom of the dough. Then work the Marzipan into thin pieces and scatter them on top of the apples. 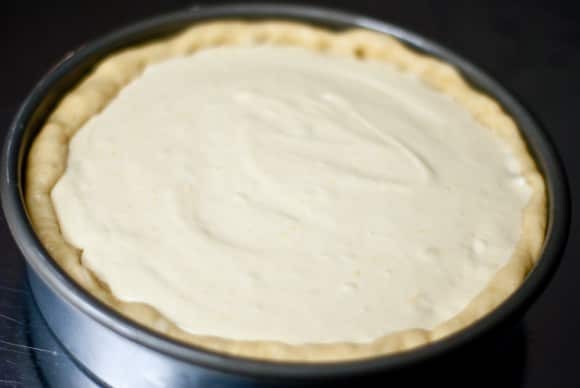 To make the cream cheese topping, add the cream cheese, sugar, vanilla and lemon zest into the bowl of an electric mixer fitted with the paddle attachment. Beat until smooth and creamy scraping down the sides several times. Add the egg and continue beating until shiny and smooth. Pour mixture over the apples and marzipan making sure it doesn't go above the rim of dough (you may need to press the dough up further). Let this rest for about 20 minutes then put it in the oven. 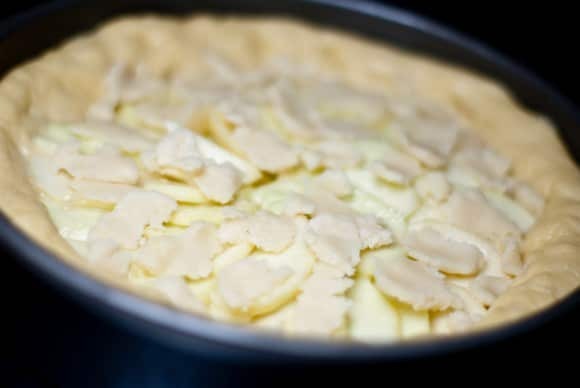 Bake until golden brown around the edges and the center is just a little jiggly about 40 minutes. I am digging the marzipan innovation! And that pic on my blog, I must admit w/red face is not mine. My guy actually ended up looking exactly like your guy did–I just can never remember to take a picture of what I make. To put a positive spin on it, I guess I’m just too spontaneous! Anyway, I love this! The pictures said it all. But the wonderful ingredients sealed the deal for me. Looks like an unbeatable combination of flavors, Marc. This is just gorgeous! It looks so rich and creamy. That looks really amazing. I love the shot of it baked and still in the tin. The crust looks perfect. Oh, that looks so good. Especially because I love eating “dessert” for breakfast. A beautiful dessert! You still didn’t quite follow a recipe 🙂 I’m just like that. I have a theory that, when it comes to dessert, everyone likes apple and lemon. Almost everyone likes chocolate, but when I am making dessert for someone I don’t know well, I will usually stick with apple. I just bookmarked this for next time! Oh boy.. i had to sit down when i saw those pictures. One word.. awesome! Gotta try this. This looks incredible! I’ve never seen anything like this, and will definately be adding it to my ‘things to bake soon’ list. Thanks for sharing! Re: tag, no pressure dear, completely understand! OMG, I love quark so much…. This kuchen sounds so delicious, I have to make this! Apples baked in pastry with cream cheese?! This sounds so good! 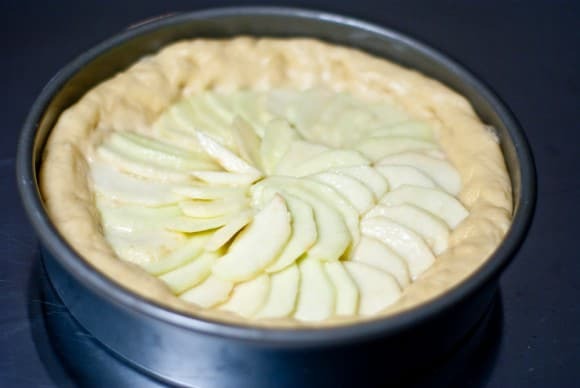 Loved the sound of Jenni’s original and love the sound of this too – apple-based desserts (tarts, crumbles, cakes, and just about anything apple…) are among my favourites. Love the look of that! Apples and cream cheese – yum! Marc, wow that looks delightful-creamy a sweet treat! i wish i could have this for breakfast right now! i’m don’t usually dive right into sweet stuff but i love the cream cheese filling. i’ve tried quark from the farmer’s market before and it’s delicious. which reminds me i should probably go pick some up soon. Cheese and apples! You got it. The first picture just looks heavenly. oh yes, apples, marzipan, cheese? how can you go wrong?? and as usual your pics are divine. The texture looks light and lovely. Must be delicious. And, I loved Quark on DS9! Pictures seem so appetizing! I’ll definitely try this. That’s fancy! Looks great Marc! Wow! What a stunning dessert. Pass me a fork please! This looks delicious! Love the marzipan idea!